PanARMENIAN.Net - Key Account Management has become a common practice in many leading companies impacting their further development, including growth in revenues. According to some observations this domain has received little or no attention in Armenia. 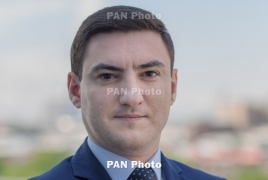 In our interview with Hayk Petrosyan, consultant at Ameria Management Advisory Services, we talked about the importance of Key Account Management (KAM), the extent to which it is practiced and developed in Armenia and a number of other issues. You conducted research into key account management involving a number of large UK organizations, based on which you co-authored an article with Dr. Rodrigo Guesalaga from Cranfield University published in the International Journal of Sales Transformation. What is actually the essence of key account management? First of all I would like to note that in this context the word “account” is not used as an accounting or banking term, so we could as well call it “key client management” however, in professional and academic domains the term key account management (KAM) is used. Key Account Management is the process of distinguishing a portfolio of clients (accounts), based on pre-defined set of criteria, which are of strategic importance for the organization and its long term success and by allocating internal resources delivering a service or product tailored to their individual needs. In addition, KAM involves developing and maintaining long-term, sustainable and mutually beneficial relationships with these key accounts. When did KAM emerge as a practice and in general in which sectors KAM is commonly practiced? Companies started practicing KAM from70-80-ies of the previous century but back then, of course, it was not organized in the way it is today. The first academic studies into KAM were conducted at the end of 70-ies and the beginning of 80-ies of the 20-th century. XEROX and IBM were among the first companies who began paying particular attention to the importance of building institutional and long-term relationships with their strategically important clients. As to the sectors, manufacturing companies started practicing KAM first and then companies from services sectors began adopting the practice too. For instance, many large, international service companies from legal, consulting and accounting sectors in European countries have successfully implemented KAM programs as they realize the value of building sustainable and long-term relationship with their strategically important clients. Among other international manufacturing companies that have adopted KAM are General Electric, 3M, Siemens, Rolls-Royce and so on. So it is an established practice in countries with developed economies and business environment. What are the benefits of implementing KAM and why should organizations be interested in it? To answer your question I can refer to a research conducted by Frederick Reichheld, an internationally renowned business strategist and a partner at Bain & Company, one of the world’s top business consulting firms. According to his research, 5% growth in customer retention rate (CRR) can result in 25-95% growth in company’s revenues. This becomes especially important in the case of key accounts when increasing the CRR of large key accounts by only 5% can have a great potential for the company to realize its long-term objectives and significantly increase its revenues. Here is another argument. By applying the so-called Pareto principle (which is known also as the rule of 80/20) to sales, we could say that around 80% or the large part of a company’s sales is generated from 20% or a relatively small number of customers. If the significant portion of company’s revenue is generated by a relatively small number of clients, naturally this 20% must be treated differently than those clients who purchase the services or products of the company from time to time. KAM is an effective tool for distinguishing from this 20% those clients that are of strategic importance for the company and engaging with them in a deeper and more personalized relationship. What is needed for a successful implementation of a KAM program? First of all we must realize that it is not possible to implement a large-scale program like KAM without direct support of the company’s management. Moreover, successful implementation of the program becomes more probable when a member of the senior management team acts as a project sponsor and supports its implementation. This is especially important since the implementation of programs such as KAM might require a change in the corporate culture of some departments or even in the whole company towards more client-centricity, but as we know significant changes in companies often face resistance from some groups of employees. People usually do not like changes because change means doing things differently and often leaving their comfort zone. The issue becomes even more complicated when colleagues who do not share and support the idea of KAM, are on a higher level in the corporate hierarchy than the manager who implements the program. Knowing this the key account manager should have a clear strategy on how to act in such situations to successfully implement the program despite the “resistance” of some colleagues. This is where the practical engagement of the senior management supporting KAM program is required. This means talking about the importance of the program during internal meetings and discussions and demonstrating that they support both the idea and the program itself. This will serve as a catalyzer for changing the attitudes of the “resistant” colleagues who are against the implementation of the new program. Of course this is only one factor which can help to create a successful key account management program. There are other key steps as well which if taken would increase the probability of successfully implementing a KAM program, but this, I think, is a subject of another conversation. Is KAM developed in Armenia? If yes, in what sectors it is practiced? I think many organizations apply some elements of KAM in one way or another, even if they do not call it KAM and do not have an established procedure and a successful experience of its implementation. But, I think only a few of them realize the full potential of KAM and appreciate the tangible benefits the company can have from its proper implementation. From my experience I can say that there are not many companies in Armenia which are even familiar with the concept, but there are also those, usually representatives or subsidiaries of international organizations or IT companies, that have key account managers and experience of implementing such a program, but they are very few. I think we should raise awareness about KAM in Armenia and show to companies how they can benefit from it. This will also contribute to the improvement of the overall quality of services in Armenia which is extremely important. We would be glad to provide professional advice and consultations to companies that share the importance of KAM and strive to build sustainable, long-term and institutional relations with their key clients.